In what may be the most effective viral marketing for Anchorman 2 yet, director Adam McKay says the recent sequel—and its even more recent alternate version—is really and truly the end to the compelling and rich story of Ron Burgundy, et al. “It’s done,” McKay tells Empire. “I think that’s it. 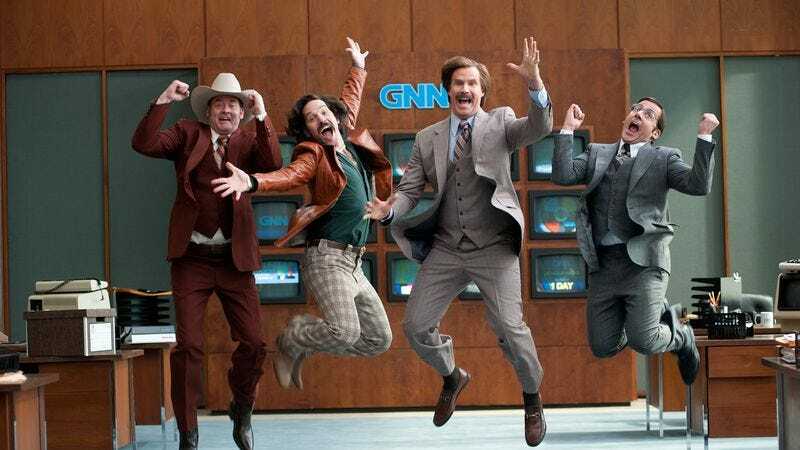 It was great to do it and it was so fun to work with those guys again, but I think that’s it for Ron Burgundy.” McKay’s preemptive declaration should stave off the revival talk that trailed the original forever, leading to this past year’s Burgundy promotional blitzkrieg, a sequel that grossed well over $100 million domestically, and Will Ferrell having to fight his alter ego for control of his soul, a la Stephen King’s The Dark Half. But Ferrell is free now, with McKay saying “definitely no” to any further Anchorman sequels—or any sequel at all, as he also seemed to quell those equally persistent rumors of Step Brothers 2 by saying, “That’s the last sequel we’re gonna do.” Still, McKay and Ferrell graciously spent the past year assembling enough Ron Burgundy footage across the whole of media that it can all probably be cut and recut to last us the rest of our natural lives.